KSA's Abdullah Al-Sharbatly was a star on the grass arena in Sustainable City where the CSI2* Sustainable City Grand Prix was successfully organized. The four day event took place from 13th February to 16th February. Riders from 28 countries participated in the competition which saw a massive audience and multiple events organized over four days for visitors' entertainment. Al-Sharbatly put on a series of spectacular performances in various competitions and ended up winning three of them. 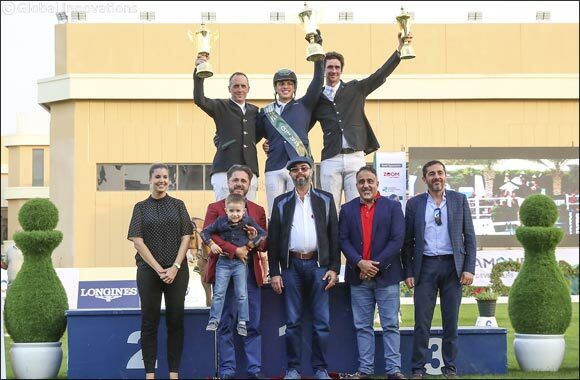 Al-Sharbatly won the CSI2* Sustainable City Grand Prix riding on his horse ‘Woulon L' after completing the second round in 42.78 seconds, and remained in first place till the end of the competition. Al-Sharbatly maintained his record by winning the Sustainable City cup in February, last season. The Grand Prix consists of two rounds, with two different designs of courses, in which obstacles are placed at a height of 145 cm. 19 male and female riders participated in the main round. In the second round, the ten best-ranked riders of the first round participated. Three riders completed the second round with a clean performance without committing any faults. Second place went to the Irish rider, Shane Breen, who rode ‘Colmar' and took 43.08 seconds to complete the second round. Ireland's David Simpson with ‘Foudre F' came in third after completing the second round without faults in 44.18 seconds. Held under the supervision of the UAE Equestrian and Racing Federation (UAEERF), this Sustainable City competition is an example of just how successful shows in the UAE have become. The level of riders and quality of show jumping at the Sustainable City Horse Jumping Competition 2019 is indicative of just how far the country has come. Al-Sharbatly won his first prize in the championship with his horse ‘Quinlan', moving from the second place in the CSI2* Small Tour in which jumps were set at a height of 125 cm, to first place of the Special Two Phases of CSI2* Big Tour in which obstacles were placed at a height of 140 cm. 25 male and female riders participated in the competition, of which nine managed to complete the two rounds without any faults. Al-Sharbatly recorded the best time in the second round with ‘Quinlan' in 26.21 seconds. Dimitri Natsis of Greece with ‘Dyrein' came second, taking 28.01 seconds to complete the second round while the third place went to the Bahraini rider Khalid Hilal Al Khatri with ‘Sierra', who took 29.28 seconds to complete the second round. Al-Sharbatly completed his double after winning a competition in the CSI2* Medium Tour of two rounds in which obstacles were placed at a height of 135 cm. 34 male and female riders participated in the competition, of which 25 riders competed, and 14 managed to complete the first round without any faults, while a further 11 completed the second round without faults. Al-Sharbatly on his horse ‘Carrerra' bagged first place, after completing the second round in 24.55 seconds. Syria's Hisham Ghrayb with ‘K.Abrax' came second after completing the round in 24.64 seconds and the third place went to the UAE rider, Arif Ahmed Jassim Ali Ahli, who rode on ‘Elise' and completed the second round in 25.13 seconds. UAE rider Moh'd Shafi M. Al Remeithi riding on ‘Venus De Vy' bagged first place in the CSI2* Medium Tour competition which consisted of One Round with Jump-off, in which jumps were placed at a height of 135 cm. 26 male and female riders participated in the competition, of which eight competed in the main round. Al Remeithi, the last participant in the Jump-off round, was the only one who managed to complete the round without faults, in 45.36 seconds. The second place went to Syrian rider, Hisham Ghrayb, with ‘K.Abrax' who completed the jump-off round with the best time in 33.49 seconds, but with four penalty points. Denmark's Tina Lund with ‘Beyond Fellow Dancing K' came in third after completing the round in 38.72 seconds, with four faults. On the final day of the Sustainable City International Horse Jumping Competition, an accumulator competition was held to collect the most number of points, in which ten obstacles were placed at a height of 135 cm, except the Joker which is usually higher than all other jumps. 15 riders participated, four of which were able to score the full 65 points. Dimitri Natsis with ‘Durein' won by collecting all points in 52.21 seconds. Tina Lund with ‘Indiana Van Klapscheut' took 53.52 seconds to collect all points and came in second. The third place went to the Irish rider, Trevor Breen, riding ‘Corenter Va' who collected the full points in 54.11 seconds. Syrian rider Hisham Ghrayb won the first place of the competition's first day of the CSI2* Small Tour with the Special Two Phases specifications, in which jumps were set at a height of 125 cm. 26 male and female riders participated in the competition, of which six completed the round without any faults. Hisham Ghrayb with ‘K. Abrax' took first place riding in 22.97 seconds, managing to beat out KSA's Abdullah Al-Sharbatly with ‘Quinlan' who rode in 23.62 seconds and came in second. In a time of 24.35 seconds, the Syrian rider, Youssef Sawas, completed the second round on his horse ‘Elton' coming in third place. In the CSI2* Small Tour competition, having One Round with Jump-off specifications, obstacles were placed at a height of 125 cm. 35 male and female riders participated in the competition, of which 13 completed the main round without faults, and eight completed the jump-off round without faults. Time was the main factor in deciding the places of the riders. Danish rider, Tina Lund, came in first place with ‘Beyond Fellow Dancing K', taking 31.87 seconds to complete the jump-off round. Syria's Hisham Ghrayb with ‘K.Abrax' came second after completing the jump-off round in 32.80 seconds. The third place went to the Irish rider, Trevor Breen, who rode on ‘Corenter Va' and completed the jump-off round in 33.34 seconds.